Keeping in theme with my previous build, I decided to create another realistic re-creation of a contemporary setting. This public restroom for men is only a small section of the room itself, but it’s large enough to incorporate a few key details. 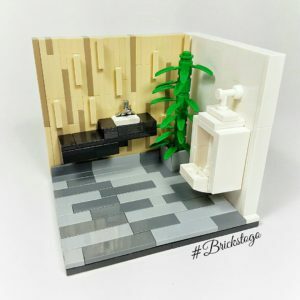 Because there wasn’t too much to add to this build other than the sink and urinal, I decided to really focus on the small details within the build, like the snot technique for the wall to create the vertical striped pattern in the wall. Luckily enough, I happened to have an old silver Lego tap that almost makes this creation appear to not be made of Lego. It’s not a common piece and can easily be mistaken for the real thing. Why they stopped making these pieces is beyond me! I added a textured floor pattern to break up the monotony of the grey stone floor, as well as a large plant in the corner to add some colour in contrast with the dull shades that make up this entire MOC. This build too got great feedback, surprisingly enough since it’s just a restroom! Although with the smaller builds you learn to appreciate the details and thought processes that go into creating small MOCs.